As an English teacher, I know how important mechanics, grammar, and punctuation are to any writing endeavor. However, I also know how dry and boring these lessons can become if we simply diagram sentences with students. For years, I have been searching for ways to ‘gamify’ my classroom a bit more to increase engagement in content learning. Last month, I wrote about my argument games- five games to incorporate into your argument/persuasive writing unit. Like these games, my grammar games work to practice these challenging skills in a fun, collaborative, and even competitive manner. Check these out to ‘gamify’ your grammar lessons and get your students excited about sentence structure and punctuation! To begin teaching compound and complex sentences, I quickly realized that I was going to need to refresh on the basics of simple sentences. I started by introducing the idea that sentences need a subject, a verb, and a complete thought. Then, I had students practice by writing two word sentences so that they could really grasp this concept. We generated a list through our discussion to display in the room. Then we played the Simply Sentence Smack Down game. For this game, you will need to invest in two fly swatters. You will also need to create examples of complete simple sentences, and fragmented sentences. I made these very large using chart paper, and I created 15 examples of each. Then, I laminated these and added magnets to the back so I could place them all over my whiteboard. These could easily be taped to the board as well; I just created them with the intention of using them each year. Then I split the class into two teams, and cleared the desks to the side of the room. One person is selected from each group (each student will have a turn). These two people will each receive a fly swatter, and stand at the opposite side of the room as these sentences are posted. I ask students to turn away from the board, so they cannot see the sentences. Then, I will call out either “simple sentence” or “fragment sentence”, and then I will say go! These two students will turn around, and RUN to the board searching for an appropriate example. The first student to use the fly swatter to ‘smack’ the correct example will win a point for their team! I then remove this example from the board and play continues with a new partner from each team! *Helpful tip. Have each team line up on either side of the room, so it is clear which student will go next in line. Also, be sure to have a quick safety and appropriate use discussion before playing. I have had students take this far too seriously and run right into the whiteboard! They were okay, of course, but it was unnecessary and distracting. After teaching students how to combine sentences with the appropriate punctuation and these amazing conjunctive adverbs, I ask students to practice with this Tic-Tac-Know game. On the projector screen, I will display two similar sentences that can be combined with a conjunctive adverb. I was thirsty. I drank some water. I ask students to combine these sentences together with a fitting conjunctive adverb as independent practice. Then, I will display eight more sentences and ask students to do the same. In the past, this is where the lesson ended. Now, as I work to incorporate these grammar games into my lessons, I play this Tic-Tac-Know game. Students are given a traditional Tic-Tac-Toe board and asked to partner with a neighbor. As I reveal the answers to these sentences (sharing possible conjunctive adverbs, and discussing these as a class), students that have created a sentence that applies these with the correct punctuation, can take a turn in the Tic-Tac-Toe board game. If students do not get the sentence correct, they cannot mark the board with an X or an O. Then we continue to reveal the answers as student partners play their Tic-Tac-Toe board game. This Tic-Tac-Know board could be used in so many practice applications in the classroom! After this initial practice with Conjunctive Adverbs, students are ready for the Conjunctive Adverb Ball Toss game. This game will get them working in collaboration with three peers, and incorporate movement into your lesson. To prepare for this game, you will need to purchase enough beach balls for each group of four in your classroom. I simply went to party city and bought two packs of 8 mini-beach balls for a minimal investment. Then, I used a Sharpie to write common conjunctive adverbs into each section of the beach ball. To play the game, one student (in this group of four) will toss this conjunctive adverb ball to one other student in the group. The person who catches this ball will create a compound sentence using the conjunctive adverb closest to their thumb. The person who tossed the ball will write down the sentence using the appropriate punctuation. The game continues until one group has created and written twenty sentences on their worksheet. This group will rush to sit down, as the first group to sit down and have twenty correctly written sentences will WIN! Groups can help each other with the punctuation and ideas as needed. This allows for that collaboration and a great opportunity to learn from one another. 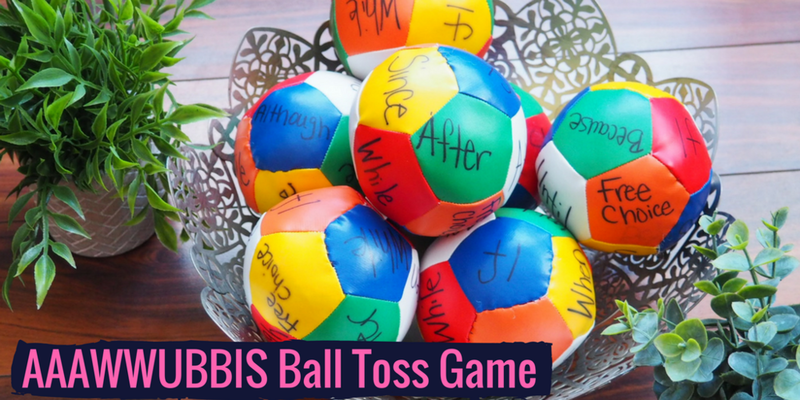 I was surprised at how competitive students were with this game; it quickly became a game that students would ask to play whenever we had a few extra minutes of class! When my students are ready to start making complex sentences, I teach them the AAAWWUBBIS words that cause introductory phrases. After this lesson, stations, and practice, we are ready to play the AAAWWUBBIS Ball Toss game. (For more information on this lesson, click on the image above.) The AAAWWUBBIS Ball Toss game is a replica of my Conjunctive Adverb Ball Toss Game. For this game, I purchased more balls from Party City. These have several spaces for the AAAWWUBIS words. Then, students will partner or group to play the game, using the word that is closest to their thumb to create complex sentences with these introductory phrases! The team that sits down, and has correctly created twenty complex sentences with proper punctuation, WINS! For these, and more fun Grammar Games, check out my Grammar- Sentence Structure Bundle. This will include lessons on creating compound sentences with FANBOYS, Semicolons, Conjunctive Adverbs, and Appositive Phrases. This will also include lessons on creating complex sentences with introductory phrases. Each part of this bundle includes the lesson, practice, stations, games, posters, and assessments. These are available as individual units within my store as well! Liz is a collaborator on teachwriting.org and the founder of Teach BeTween the Lines. She has been teaching for over ten years; she has loved growing young minds through literature and the art of crafting the written word. She is currently working on her doctorate in Education from the University of Minnesota, and holds an M.A. in Education from St. Mary’s University, Minnesota. She loves to write short stories in her free time, especially in those cold Minnesota winters. She is supported by a wonderful family made better by the addition of her two beautiful children.